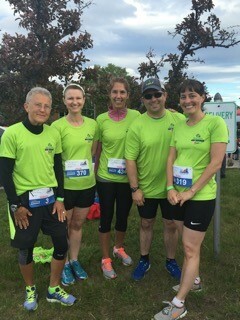 LeBlanc & Young teamed up with Seacoast Cares to participate in the Maine Cancer Foundation’s Twilight 5K, held annually at the Southern Maine Community College in South Portland. This is the fourth year the firm has joined in the event. LeBlanc & Young runners are pictured (left to right): Taryn Adams, Julie Scala, Tara Weller, Justin LeBlanc, and Eliza Nichols. Taryn Adams placed first in her division.